Welcome to my second blog entry as a LSG Sky Chefs Cross Border Trainee. Over five months went by since I became part of the program back in September. Today, I would like to give you an impression of how the first couple of months went and what I experienced so far. For every new Cross Border Trainee, the first few weeks of the program consist of a scheduled rotation through different departments. Before I got started with my rotation, however, I had the chance to meet my personal mentor for the assignment in Stockholm. During each assignment, I will be accompanied by an experienced manager, in my first year the Scandinavian Lead Unit Manager, which will support me and provide professional help and advice. I think it is safe to say that the relationship between mentor and trainee is one of the essential parts of LSG Sky Chefs’ Cross Border program. After meeting my mentor, I started with my rotation through the departments and got a first glimpse of the unit in Stockholm. Over the course of the next four to five weeks, I had the opportunity to get an insight into areas such as Sales, Procurement, Goods Receiving, Production and Dispatch. During these weeks, I spent a lot of time with the respective department heads and got to know the day-to-day routine as well as the processes in the different areas of the unit. On top of all that, I quickly became familiar with LSG’s ‘hands-on’ approach and was able to experience first-hand how much work it really is to pack, to prepare and to load an entire flight. In November, I then had the chance to meet all other trainees during the Cross Border Development Conference at the Lufthansa Training and Conference Center in Seeheim-Jugenheim. The annual week-long conference is an ideal opportunity to get to know each other and therefore, I was really looking forward to the event and the chance to finally meet my fellow trainees from all over the world. The week started with a warm welcome by the program coordinators and various team building activities followed by interesting workshops dealing with topics such as Project and Change Management. Wednesday then marked one of the highlights of the week. We were invited to visit, nearby the airport in Frankfurt. 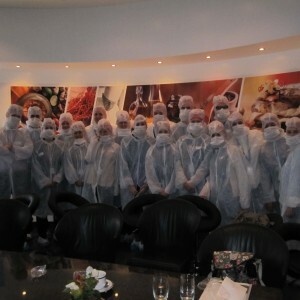 The visit consisted of a menu presentation as well as a tour through the unit and was the official kick-off for our Cross Border Group Goal – a project on which all trainees will be working over the course of the assignment. Another highlight and the successful conclusion of the week followed just one day later, when current LSG Sky Chefs’ CFO Dr. Kristin Neumann took the time and joined us for an interesting and informative fireside chat in a relaxed atmosphere. When looking back at the first few months of the program, I have to say that my time as a Cross Border Trainee really lived up to its promise. The get-together with all the other trainees in November was a great experience and a reminder of the international orientation of the program. Furthermore, I am able to work on interesting as well as challenging projects that are interrelated with various different areas of the business. All in all, the program is exactly what I was hoping for and then some. With the next application period forthcoming, I will talk about my personal experiences during the application procedure for the program in the upcoming blog entry. Make sure you don’t miss it! Times are a-changing at LSG Sky Chefs!